I’ve been thinking a lot about the two men, a dairy farmer and a milk salesman, who were executed on Tuesday for their role in the tainted milk scandal in China. You may recall that 30,000 people were sickened, and six died, from milk tainted with melamine – an industrial chemical none of us had ever heard of before. Here’s the thing: we tend to look on these executions with distaste, a sign that China, despite its vibrant role in global capitalism, is still out of touch with Western ideas. There can be no doubt that these executions, however, are in the service of capitalism. They are indented as a sign that China takes its regulatory role seriously. But still – executing people because of their business decisions doesn’t sit well with us here in the west. It seems cruel and oppressive. Personally, I’m not a big fan of the death penalty. I don’t know that I have anything against it on principle, but I tend to think it is deployed unjustly and haphazardly in the US. Yet here, we would never think of executing businessmen for their decisions, even if those decisions resulted in death. We punish businesses, not people, for these sorts of things. No one went to jail for passing off Vioxx as a safe pain reliever, did they? Yet the decision to do harm on a grand scale, in the service of profit, is made not by corporations but by people – people who make amoral decisions because they want to enrich themselves and their interests. 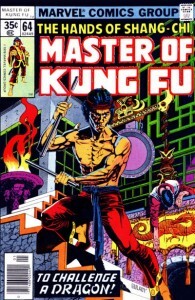 I know what Shang-Chi would do. In the US, we see killing another human being out of passion or malice or for that particular person’s wealth is reprehensible, but killing lots of people in order to promote the riches of a company, while certainly not good, is nowhere near as bad. It is possible, however, that we may have it backwards. Most people who commit murder are those who are emotionally out of control or who have adopted a lifestyle which takes them outside the law. A deterrent isn’t gong to have much of an impact on such people. On the other hand, those who commit industrial or corporate murder do so only because they believe they opportunity for profit outweighs the consequence of exposure. Maybe the specter of lethal injection would make these guys think twice. Me and a big star. I bask in his glory. For almost ten years I have been in touch with a film producer named Tom Hodges (also an actor – fan boys and girls might remember him from his guest appearance on Deep Space Nine, season 5, episode 24; one of the best seasons, no?) about the prospect of adapting one of my novels. This book has been in and out of option – mostly in – during these years, but the rights have just reverted back to me after another producer crapped out. By freaky conincidence, Tom emailed me a couple of weeks ago to check in and to say that if I should happen to be in Ann Arbor in the next few weeks I should visit the set of a film he’s working on. As it happens, I was in Ann Arbor last week, so on a very cold Friday morning I hung out for a few hours of the set of Trust, starring Clive Owen and Catherine Keener, and directed by David Schwimmer. Some of you might associate Schwimmer with his role on one of those big ‘90s sitcoms, which I never saw myself (though I recall fondly his stirring performance as Greenzo on 30 Rock, among many other things), but this film is no comedy. It’s a gritty drama about a man trying to track down the sexual predator who raped his daughter, and the one scene I witnessed was pretty powerful stuff. 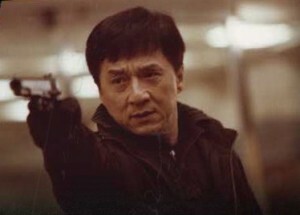 Hats off to Schwim (possibly “Schwimm”), says I, for making such a gutsy film. 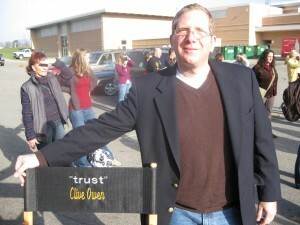 Me and Clive Owen's Chair in a high school parking lot. It turns out that neither Clive Owen nor Catherine Keener like to be photographed while on the set, lest their souls be stolen. They also don’t like to make chitchat with strangers, so I did not get to raise my charisma score by talking to them (though my ability to brave the Michigan cold speaks to my strong rolling in the constitution category, but I took a -1 penalty to wisdom). Still, I got to meet the director, who struck me as an all around good guy, and Tom himself, who was also a great guy and a pleasure to hang out with after ten years of emailing. Will this lead to a film deal? We’re talking the movie business here, so the answer is maybe. I may also start perspiring liquid gold. Still, you never know. Gotta be in it to win it. And all that. Some pre-airport blogging. I’m off within the hour for Michigan, where I’ll be speaking at the Jewish book fairs in Detroit and Ann Arbor. I may also be visiting a film set there and talking to some people who may have some ideas about something I may have written. I’m being vague. In any case, I’m hoping at the very least to have some cool pictures to post when I get back. It is also my hope that I’ll soon have some exciting news to hint at, but not actually reveal, regarding a new comics project. And, finally, one of my readers complained that I never post updates on my writing. The writing is going fine. Thank you so much for asking. The book in progress, The Darkening Green (all titles subject to alteration) is due in mid February for a spring, 2011 publication. Right now everything is on track. Yeah, so I didn’t mean to go so long without posting an entry, but Tuesday, when I’d set some time aside to write a post, I had to rush off to the vet instead. The new kitten (see previous posts) is stressing out my older cat, and causing his bladder to seize up – this is something that happens to cats under stress, my vet tells me. I thought it was a urinary track blockage, which as you owner of male cats will know is life-threatening stuff. But it seems like everything is settling down now. 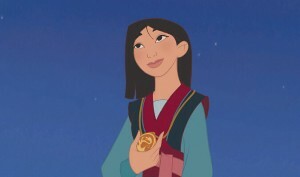 I know you are relieved. I will try to refrain from blogging about my cats for the next few weeks, so I will thank you all in advance for your kind wishes and get-well-soon gifts for Rupert. The Texas Book Festival went well, in case you were wondering. My panel was a discussion with historian Jacqueline Jones, author of (most recently) Saving Savannah: The City and the Civil War, and we were to talk about different approaches to history. Frankly, I was a little uptight about this. First of all, it’s always tough to be in a public discussion with a historian, because most people have this idea in their heads that they are supposed to value non-fiction over fiction, and therefore the historian will always get more questions in the Q&A. Plus, there are a few kinds of books you never want to share panel time with: primarily those on the Civil War, Word War II, or baseball. And sometimes dogs. You get the enthusiasts who come out, and the guy who writes about economic history ends up looking like a loser. Fortunately, that did not happen. The audience was pretty well packed with fiction people who had no particular interest in the Civil War, which is how I like them. I always avoid novels on the Civil War, by the way, and World War II. I like baseball books just fine. Perfectly manicured female hand not included. In other news, The Copper Bracelet, the audio-only multi-author thriller in which I was involved, is now the number one selling book on Audible. I should do projects with Jeffrey Deaver more often. 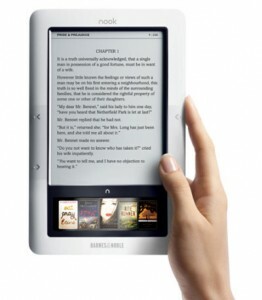 And finally, some of my readers are suggesting I stop begging for a Kindle and start begging for the Barnes and Noble ebook reader, the Nook – which some say will be a Kindle killer. What’s my move here?